My political opinions lean more and more to Anarchy (philosophically understood, meaning the abolition of control not whiskered men with bombs)—or to ‘unconstitutional’ Monarchy. I would arrest anybody who uses the word State (in any sense other than the inanimate real of England and its inhabitants, a thing that has neither power, rights nor mind); and after a chance of recantation, execute them if they remained obstinate! If we could go back to personal names, it would do a lot of good. Government is an abstract noun meaning the art and process of governing and it should be an offence to write it with a capital G or so to refer to people . . . I have been struck through the years by something of the same phenomenon in the thought of Solzhenitsyn. His direct experience of the Soviet State certainly made him less than sanguine about the centralized power of bureaucracies. He wrote and spoke, instead, about the need to return to the model of the Zemtsvos, an institution created under the reforms of Alexander II that disappeared after the Revolution. Zemstvos were a modest form of self-government with local councils and elected groups made up of landowners (both large and small), clergy, urban classes and peasants. These small, local ruling councils were to determine the economic needs of any area. Part of the goal was an “economy of permanence,” rather than an economy of runaway consumption. His principles are strikingly similar to the Distributism favored by a number of Catholic thinkers such as G.K. Chesterton. What they particularly have in common is the philosophical principle of subsidiarity, which elevates the local and the small. Subsidiarity, a stated teaching of Catholic social dogma, holds that it is always preferable to do a thing as close to its result as possible (my wording). That is, do not make decisions for things any further away than necessary. It is rather “anti-statist,” and certainly anti-bureaucratic. I am neither a political philosopher nor an economist. But it is very much in my mind that three or four of the Christians whom I most admire in our contemporary age held similar views. I find myself in deep sympathy with them on many levels. In a world whose current turmoil forces careful thinking about many things, it seems natural to me to turn to those whom I must trust. My sympathies are easily understood. First, I have a deep disdain for abstraction, almost anywhere. Generalities exist only in our minds. We do not experience the “love of man.” We can only love this man, or that woman. Because human beings and their lives are utterly unique, the greater the distance we place between ourselves and those of whom we treat, the less accurate we are. A universal law may sound wonderful in theory (how could anything be more equal than one, single, universal law?). However, the myriad of exceptions that actual reality necessarily generates negates the effectiveness of such a law. Our bitter experience in contemporary times is that the “universal” law tends to negate the actual reality – “negation” being experienced as oppression and confusion. A lot of Men, ruffians mostly, came with great wagons, some to carry off the goods south-away, and others to stay. And more came. And before we knew where we were they were planted here and there all over the Shire, and were felling trees and digging and building themselves sheds and houses just as they liked. soon they began lording it around and taking what they wanted. Those events in Middle Earth find an almost identical echo in CS Lewis’ depiction of the N.I.C.E and its takeover of Bragdon Woods in That Hideous Strength. He pictures an agency, with a wide-ranging mandate, setting about destroying everything human, decent and worth having in the name of some better, greater scheme (later revealed to have been directed from hell itself). Prison sentences without measure, simply because they “only lasted” until the prisoner had “reformed.” In the name of being humane, the most inhuman things were allowed. These thoughts on the political and economic structures of the world are not alien to theology, much less to Orthodox thought. 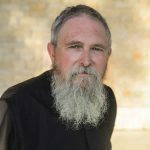 Though Orthodoxy has never espoused an economic theory, such as distributism, nor codified a philosophical principle, such as subsidiarity, there are, nonetheless, certain aspects of Orthodoxy that show a preference for the small and the local. In opposition to the levelling and impersonal standardization promoted by globalization, and also to the extremes of nationalism, the Orthodox Church proposes the protection of the identities of peoples and the strengthening of local identity. As an alternative example for the unity of mankind, she proposes the articulated organization of the Church on the basis of the equality of the local Churches. The habits of modern cultures have become attuned to the generalizations of distant bureaucracies. Our loyalties are attuned to distant sounds rather than local reality. Neighbors are the most likely strangers in our lives, while true strangers become our “friends.” These are the habits of alienation and loneliness: friends whom one only sees in digitalized form, but never touches. Orthodoxy holds the sacramental encounter with God to be the primary means of salvation. We may make professions of faith in things that seem removed, but this abstracted religious form is ultimately alien to Orthodoxy (and classical Christianity). The Christ Whom we believe in, is none other than the Christ Whom we eat and drink. The physicality of the faith also guards the local nature of the faith. The “two or three who gather together” must gather locally, not just in a chat room. The Orthodox embodiment of the Church has always emphasized its local character. No single language or culture can be seen as the epitome of Orthodoxy. The absence of Great Councils over many centuries is not a failure or lack of unity. Rather, General Councils are themselves rightly seen as failures, required to meet only by the extreme necessity of dangerously threatening heresies. The adequacy of each local Church (defined as a Church with a governing Synod of Bishops), is able to choose and consecrate its bishops, glorify saints, and arrange for the well-being and good order of its life. Each Church is itself the fullness of the Church, and not merely an inadequate branch. The contemporary ideology of globalization, which is being imposed imperceptibly and expanding rapidly, is already provoking powerful shocks to the economy and to society on a world-wide scale. Its imposition has created new forms of systematic exploitation and social injustice; it has planned the gradual neutralization of the impediments from opposing national, religious, ideological and other traditions and has already led to the weakening or complete reversal of social acquisitions on the pretext of the allegedly necessary readjustment of the global economy, widening thus the gap between rich and poor, undermining the social cohesion of peoples and fanning new fires of global tensions. As I child, I was small. I enjoyed “delicate” actions (I don’t know how else to describe this). I liked working with care on small things. I found people who were not careful about such things to be “clumsy” and very likely to break the things that mattered to me. It was a childish fear, something that sometimes alienated me from siblings (I’ll say no more). I have something of the same feeling about globalization. Arguments of “prosperity” ignore the delicate disruptions that such large endeavors entail. Aggregate measures of economics never describe the specific disasters in many lives. When a stranger loses his job, it’s a “recession.” When you lose your job, it’s a “depression.” And “recoveries” in the aggregate often do very little to address the depression borne by so many. Tolkien and Solzhenitsyn (and others) gave great attention to the “littleness” of our lives. Our spiritual lives are surely no less specific. Our salvation is found in the little things, as is the truth of our existence. “Please be careful with my toys…you’ll break them.” A certain small child to an older brother. in time & space so vast and relative. where I could simply be. such a land must be. rather than face voyaging alone. upon the hopes of others. You are rock and sand and soil. and let me never drift upon the sea again. Thank you Father for this beautifully written piece. For the first time, I find myself at odds with much of its content, which is no surprise given the timing and my personal circumstances as a European living in England. I am the product of a modern project and much of what I know has been the result of half a century of violent integration. I try hard to see why people may idealise the past. There are good reasons to miss the country life, community and having a simple life in the Shire. Of course, those disaffected resemble the US communities you previously made reference to as “zombie towns”; they may have heard about the rural life, but they live in ugly towns with no prospects nor hope. England was no heaven after the war and people were still living in extreme opposites of the economic spectrum even within miles of each other. The lesson for me is to approach everyone with love in Christ. I just witnessed the first racial attack in 37 years alive and my instinct was to condemn the perpertrator. That is a difficult transformation: it requires a different mindset, a trust in God’s providence. The lesson for those in favour of Little England is that brave, democratic acts of defiance tend to attract terrible bills (cheques) for the poorest, the disaffected and the vulnerable. But perhaps the outcome of it all might prove to us all that none of this matters; salvation is why we are here, not prosperity nor political unity. Lord have mercy! Forgive me. I agree that distributionism has many attractions. Unfortunately our greed interferes as it does with any economic activity. Thank you Father. Your piece sums up the necessity of of the Local Church, the Collegiality of Bishops and of local government. Freedom can only exist when we account for the freedom of individuals to be just that, individuals. When the attempt is made to centralize power, differences must be suppressed (or bulldozed) because Central Power is not smart enough, wise enough or capable enough to account for a world full of individuals. The inevitable result is somewhat like what I experienced in my first real job as a dishwasher in a restaurant. All the food I rinsed off plates because a grey, gelatinous mass in the bottom of the sink. That is what We, the People become. We achieve equality as we are all equally poor, equally badly educated and equally miserable so no one is better than any other, anywhere. We settle into the least common denominator because that is all that government is capable of producing. It is like having a table with uneven legs and sawing off legs a little on each to level the table and stop its rocking. Anybody who has ever tried this soon finds the table flat on the floor with no legs. That is what happens to people in large bureaucratic structures. The bigger the structure the flatter we all get squashed. Bless the little, the local, the unique and the odd. I lived in England for nearly four years and I loved the little villages, with their little Pubs and odd streets and crooked houses. It felt good, homey and very much something one could fit into instead of being fitted into it. Thank you. I appreciate seeing connections between various authors connected to the value of local culture and tangibly-sized communities (not abstractions such as “state”). One of the things that first drew me to Orthodoxy was reading about the missionary work of Saint Herman and seeing how it respected and honored local culture. While this is a tangential comment, I want to thank you for the reminder of the importance, before God, of what is small. I lead a small, wonderful, unremarkable life. It’s tempting to think that I am missing out on Something Important, and won’t ever leave My Mark on this world or people in it, as if that is the point of my existence. Thank you for reminding me that God is in everything, even the small, and that it’s enough to be small in Him. Someone recently described the Shire & its relationship filled, simple glad existence of work, family, togetherness, feasting, as their view of how Orthodoxy sees human life, in a potential best expression. Which I thought was lovely. This article expresses exactly what the world needs, especially on a non-spiritual level. I think even Brexit is a symptom of the same thing that the advent of dorms-for-adults is; the loss of a sense of “place” and real community. Politics may be the most egregious area of violations, but it’s hardly the only. I’ve joined the Solidarity Party to try to work against this, but, of course, it’s a small community right now, and scattered. 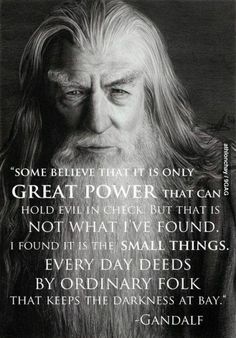 What would you think are some tangible, small steps most people can take to make the world a little more “Shire”? We settle into the least common denominator because that is all that government is capable of producing. It is like having a table with uneven legs and sawing off legs a little on each to level the table and stop its rocking. Anybody who has ever tried this soon finds the table flat on the floor with no legs. That is what happens to people in large bureaucratic structures. The bigger the structure the flatter we all get squashed. I found myself on Facebook posting an article saying I am with Brexit and wondered, as a German living for 40 years in the US, why I did this. For sure it is this sense of loss of “place, real community, friends (not the hi and by kinds here in the US, or the ones that only talk to you if you have a big house and money), the loss of seeing each other and paying attention, like seeing and smelling the flowers or garden, feeling the wind blowing, sensing the untouchable or quality of another’s presence, this globalization mindset which distracts from the present and nearest, like your neighbor, and missing the particular differences in people, throwing everyone together from all parts of the world and expecting peace. Also the powerlessness of our own life’s stripped little by little of self-governing, our values, traditions, in Business and schools etc. A timely article and Thank You. Always feel so enriched reading all the viewpoints and comments too. Again Than you. Read very local newspapers. Turn off the tv. Limit internet time. Shop locally, avoiding big box stores where possible. Eat natural, locally-owned foods. Work with someone on your street to have a “block party” where people can meet each other. Do it regularly. Learn names. Go mostly to the same stores and speak to people who work there. Learn their names. Buy a grave plot (plan to stay put). Walk and bike more. Open your windows when possible. Learn a foreign language. Now this sounds strange, but if you only speak your own language, then you don’t really know your own language. Learn another one in order to learn about yourself. Learn local history. Pray for the dead. Grow a garden (any size). Give stuff away to people. Become known for generosity. Avoid fashion. Make music with other people. If you don’t play an instrument, then start taking lessons. As soon as possible begin to play with others. Dance. If possible find a way and a place to dance with groups of people. Go to Church. Avoid mega-Churches if possible. Do not be generic if you can be specific. This is a small list. Lists should be small. Brilliant article! Thank you, Father. Wonderful post Father. Like Jesse, I immediately thought about the work of Wendell Berry. He has wrestled with these issues throughout his prose, fiction and poetry. While not Orthodox, he is a profoundly religious man. Yes, that’s me. 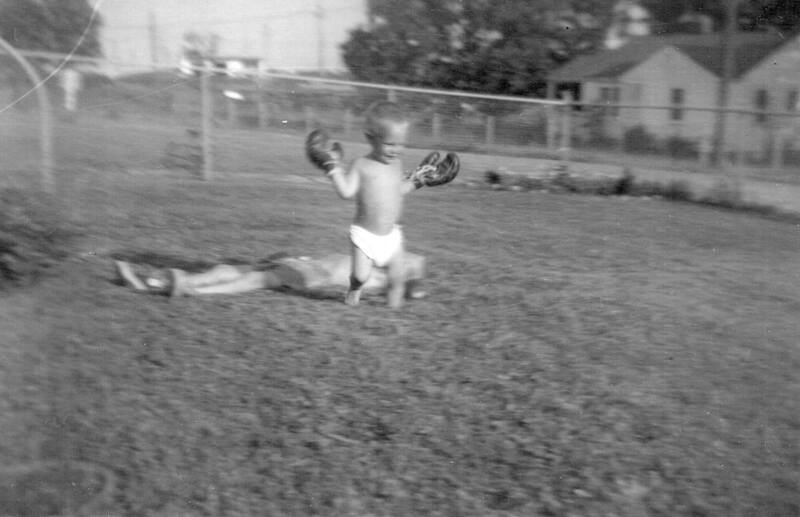 It’s 1954, the first and last time I beat my older brother in a fight. 🙂 It was a very delicate punch. To Laurie and Karen on thoughts of leading a small life. I am rereading the Mountain of Silence (Kyriacos Markides) with a friend who is not Orthodox. We were talking about this quote from Father Maximos the other day. This topic is so relevant for our society. Often I have thought about my childhood – no cell phones, no Facebook, no instagram, no possibility to have my whole life visible to either a close group of friends or the masses (depending on my settings on the application). There was a quietness, smallness and simplicity to life. Now it’s not just business and the world economy that is global…. even our lives can go global with the internet and media, and that can have serious ramifications. I got to see Dn. Joseph at our parish last weekend. We hosted an international Orthodox music symposium here in Minneapolis. It was such a beautiful gathering of Orthodox singing people, towards the end it felt like a family reunion… It made me think of what Father Stephen wrote about in the reply at 4pm yesterday. We cannot be “generic” when we meet people face to face. I hope he considers our reunion some time… I am tenacious, so I will keep after him. 🙂 Maybe my parish could host?! Agata, That sounds like a little piece of heaven to me! I look forward to using those links. Thanks! Victoria, I love that quote from Fr. Maximus! Thanks! -Because in the old times we had men of great stature; our present age is lacking in examples-and I am speaking generally about the Church and Monasticism. Today, there are more words and books and fewer living examples. We admire the holy Athletes of our Church, but without understanding how much they struggled, because we have not struggled ourselves. Had we done so, we would appreciate their pain, we would love them even more and strive with philotimo to imitate them. The Good God will of course take into account the age and conditions in which we live, and He will ask of each one of us accordingly. If we only strive even a little bit, we will merit the crown more than our ancestors. Agata, do you have a citation for that quote? I really appreciate your sharing that, it is so true and encouraging. I found this on Facebook on a page for Elder Paisios (Elder Paisios of Mount Athos). Fr. 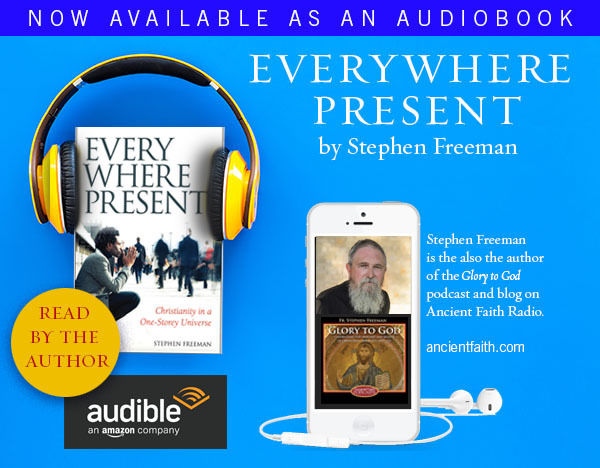 Stephen, I want to give glory to God that He has enabled you to so beautifully articulate the state of the world we find ourselves living in at present. Everything within me vibrated to your words, especially when you write about Solzhenitsyn, who is my modern-day hero. Yes, Glory to God for All Things! I hope it is OK to share this here…. I know this trail is cold, but I wanted to mention that I find the subject of global vs. local to make me think of discourse, in print or otherwise. When reading or listening I find that sometimes the topics get too global. I have always called it too ethereal or too “out there”. It’s much easier for me to understand points illustrated with stories or parables or analogies. My point isn’t to draw any immediate conclusions from this, but just to say that “local” certainly works for me when I’m trying to process new information. I’m much more attracted by “let me tell you a story” than words like “exposition” or “apologetic” or “exegesis”. Yes the communication seems personal and real. At least it seems that way to me. I’m on this blog in spurts today and caught your post as it came in.